Barrel 41 Brewing has an origin story that epitomizes how small breweries come to be these days. It begins with three friends gathered around a homebrew kettle. As tends to happen in that setting, the idea of opening a brewery is entertained. Now, about two years later, those three friends are on the verge of going pro. Neenah natives Lance Goodman, Matt Stubing, and Nate Sharpless have known each other since they were kids. "We were friends from high school," says Goodman, "but after that, we all went our separate ways." Goodman landed in Madison. Sharpless and Stubing headed for Milwaukee. "Then we bought some equipment and started making beer together," says Sharpless. And that's where the "41" of Barrel 41 comes in. "We always had to get on Highway 41 to get back home and get together," Goodman says. From left to right, Nate Sharpless, Matt Stubing, and Lance Goodman of Barrel 41. These days, the three of them are together most of the time. "We all kind of kicked it into gear this past June and started working full-time with it," says Stubing. "The last month especially has been pretty crazy." 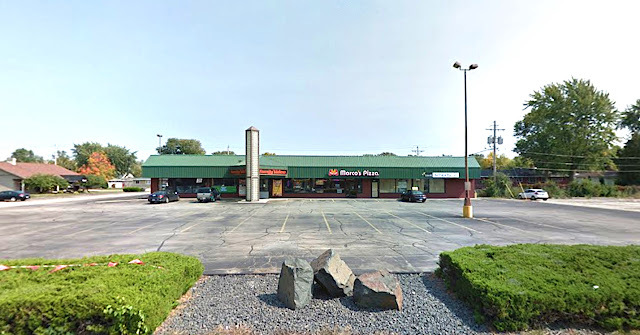 They leased a vacant storefront at 1132 South Commercial Street in Neenah and then gutted it. The interior remodeling is well underway. 1132 South Commercial Street, Neenah. Barrel 41 will occupy the space on the right side of the building. 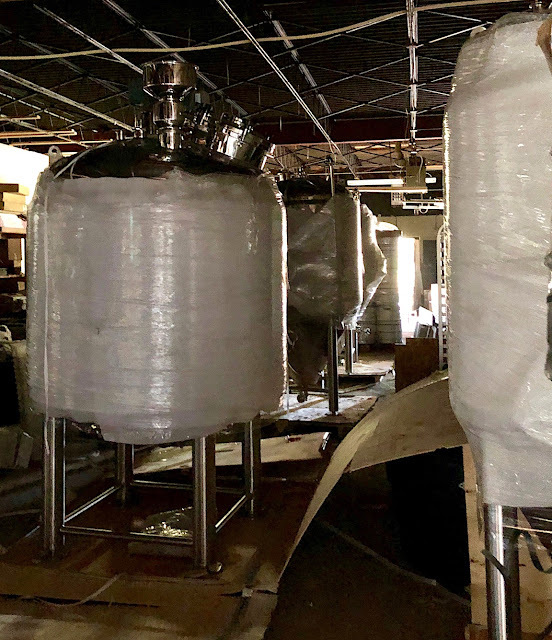 Yesterday they took delivery of their cooperage and brewing system – a seven-barrel electric brewery from Stout Tanks and Kettles of Portland. They have their federal permit in hand and their state permit being reviewed. "We should be able to brew by the week of October 15," says Goodman. That’ll put Barrel 41 on track for the fall opening Goodman, Sharpless, and Stubing have been anticipating. Sharpless, who has been an assistant brewer at Bare Bones in Oshkosh and has worked at Lion's Tail in Neenah, will be the head brewer for Barrel 41. The seven-barrel brewery will feed five seven-barrel fermenters. He'll also have a one-barrel pilot system to work with. From the September 26 delivery of the Barrel 41 brew system. Recipes for the beer that will come out of those kegs were developed at the Sunday brew sessions that inspired Barrel 41. The plan is to present a wide range, from Continental European ale styles to modern ales that showcase American hops. "We'll kind of feel it out and see how the first beers go over," says Sharpless. "We'd like to continually introduce new beers as we go along. We're going to have a lot of variety. We plan on covering all the bases." The taproom will open with 16 draft lines. "We're shooting for eight of those being our own beer, with three of them being experimental, pilot batches," says Sharpless. "We're hoping we can round out the rest of the taps with beer from other local breweries along with a gluten-free beer from Alt Brew in Madison." Most of Barrel 41's beer will pour in the brewery's own taproom. "We'll do a limited amount of draft distribution locally," says Sharpless, "but not over the top, just a handful of places." They'll also sell canned beer directly from the brewery in 25.4 and 32-ounce crowlers. The projected taproom hours are Monday through Thursday, 3-10 pm; Fridays, 3-midnight; and Saturdays, noon-midnight. Light snacks will also be available there. When completed, the 3100 square-foot brewery and taproom will include a lounge area between a window bar and the main “L” shaped bar made up of 24 and 14-foot sections. The brewery will be visible at the back of the space. "I think what we're bringing aesthetically to the taproom is going to keep people interested," says Sharpless. "Our commitment to this is over the top. We've put so much thought into every square inch of the place. Everything in here is going to be a talking piece. We'll have murals, a wood-pile wall; the bar is going to be made up from a couple of massive slabs of white oak." The brewery is bound to bring a boost to a part of Neenah in need of new blood. "Everyone in the area seems to be pretty excited about it," says Stubing. "We're hoping this will help spur the revitalization of South Commercial Street. Maybe this could be the start of a facelift for this stretch." 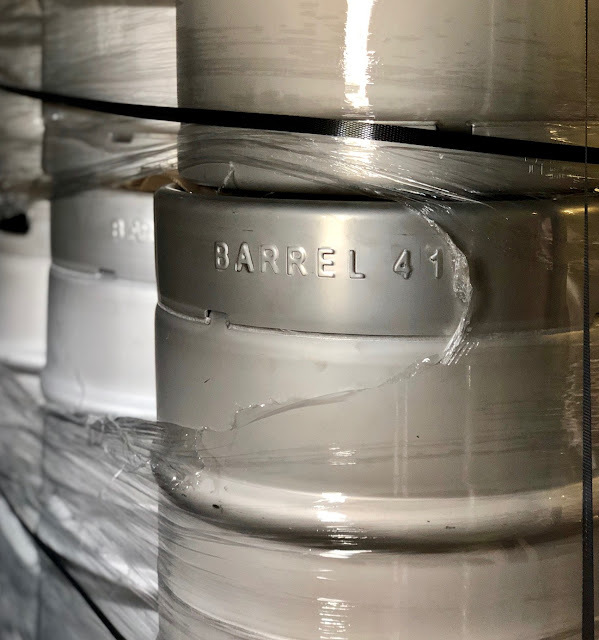 You can track the progress of Barrel 41 Brewing by signing up for their email list or by following the brewery's Facebook and Instagram pages. There have been brewers at work in Oshkosh for well over 150 years. The most elusive of them has been Rudolph Otten. Up to this point, Otten's name appears nowhere in historical lists of Wisconsin brewers. He goes similarly missing from most public records. Otten would likely have remained altogether forgotten if not for a stray tax roll from 1865. Otten didn't leave us a lot to go on. But what's there is intriguing. And it begs the question: are there others like Rudolph Otten lurking in forgotten corners of Oshkosh's past? Anton Rudolph Wilhelm Otten was born on Christmas Eve 1834 in Butjadingen, a German coastal village on the North Sea. Otten’s early life there was spent as a peasant farmer. When he was 25, he left Germany, sailing away on a migrant ship named the Ottilie. 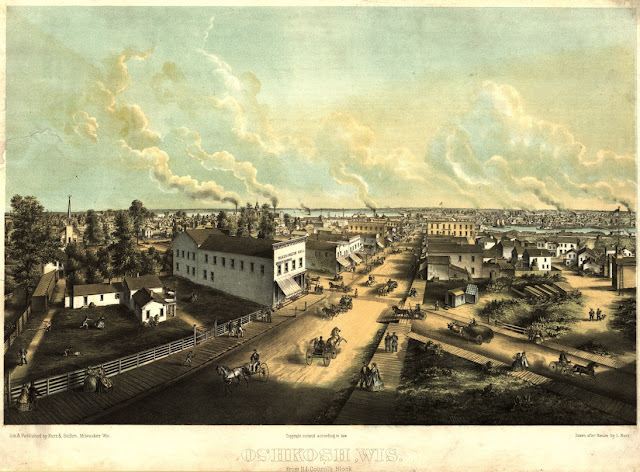 On Tuesday, July 2, 1857, after a 43-day voyage, Otten arrived in New York City. 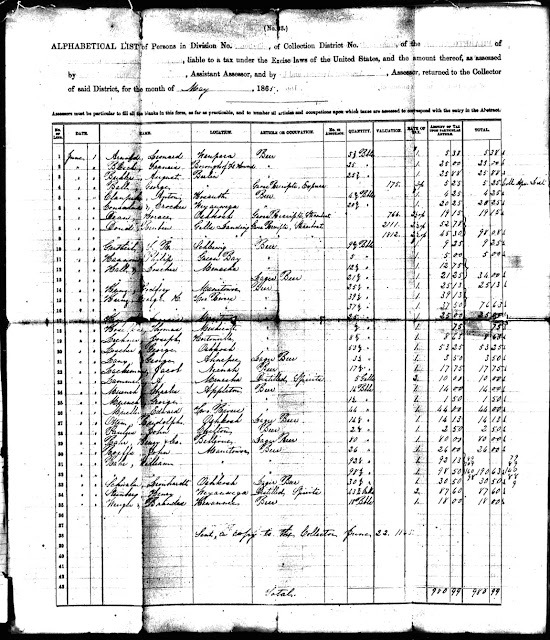 The ship’s manifest shows him bound for Wisconsin. Otten reached Winnebago County by 1858. In November of that year became a U.S. citizen. Soon after, he appears to have been married. The full name of his wife isn't known. F was the initial of her first name. It was all that was used to identify her on the gravestone of the child she had with Rudolph – a son named Franz, born in 1860. The marriage had ended – either by death or divorce – by 1865. Where Otten resided during his early years in Oshkosh or what he was doing to make a living is anyone's guess. At some point, he joined the Germania Fire Company No. 2, a group of volunteer firefighters made up of German-Americans living in Oshkosh. The company had formed in 1857, just prior to Otten's arrival here. 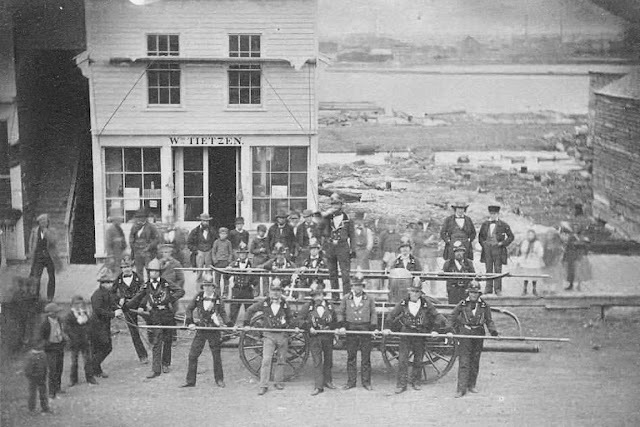 Below is a picture of Germania Fire Company No. 2. It was taken in 1860 on North Main Street. Rudolph Otten may be among those in the photo. 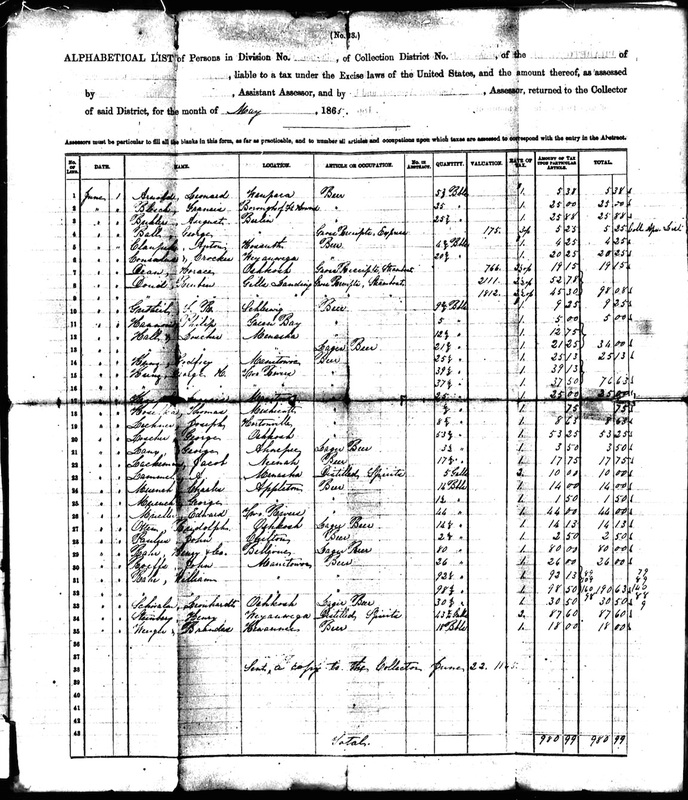 Then comes 1865 and the tax record revealing Otten as a brewer. Most records of levied excise taxes from this period are thought to have been lost. 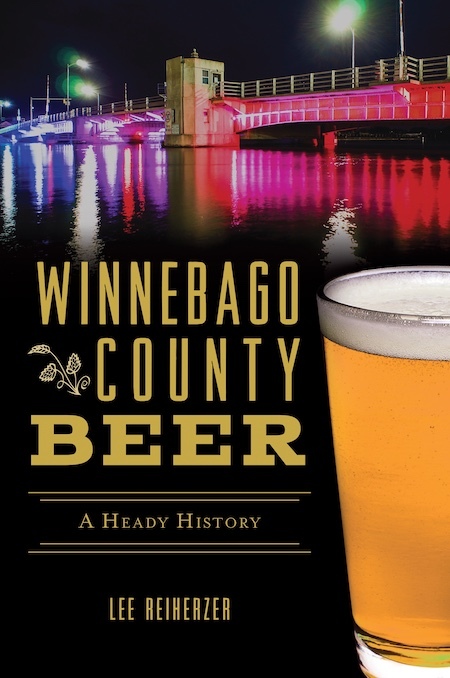 I came across this one while doing research in 2011 for The Breweries of Oshkosh book. This is where I first encountered Rudolph Otten's name. 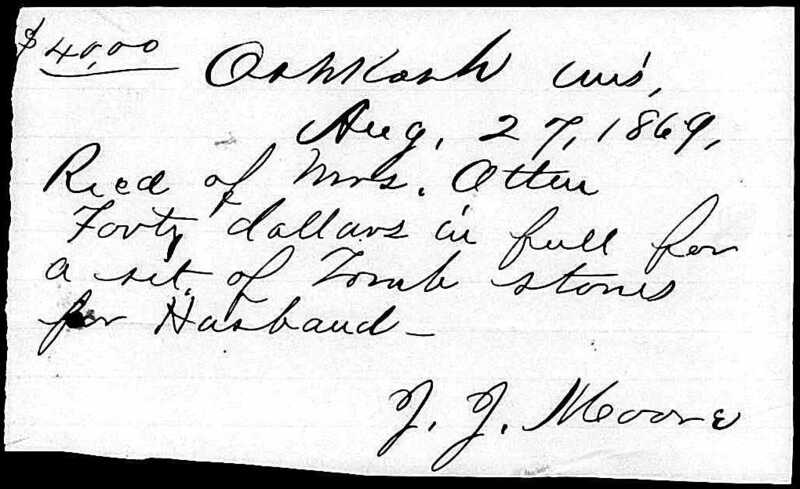 The listing shows Otten, working out of Oshkosh, produced 14.125 barrels of lager beer during the month of May, 1865. No indication is given of where in Oshkosh he made that beer. 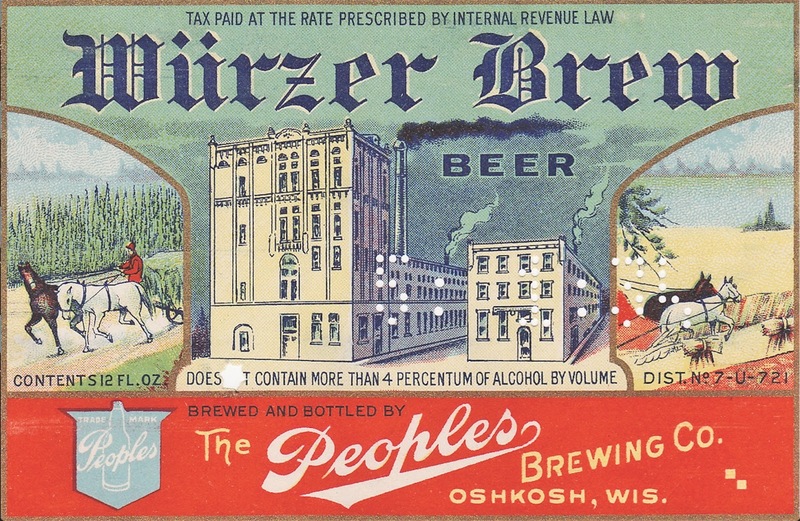 This was the beginning of a new era of brewing in Oshkosh. Brothers August and Charles Rahr were about to launch their new brewery on the east side of town. Leonhardt Schwalm had just purchased land on Doty Street where he and his brother-in-law August Horn were setting up to build the Brooklyn Brewery. The older, pre-Civil War breweries on the north side were about to be overwhelmed by larger, more advanced facilities on the south side. Aside from Otten, there were three breweries in Oshkosh at this time. But the days of those older, neighborhood breweries – the type that could get by producing 14 barrels a month – were coming to an end. We can only guess how Otten fits within all this. 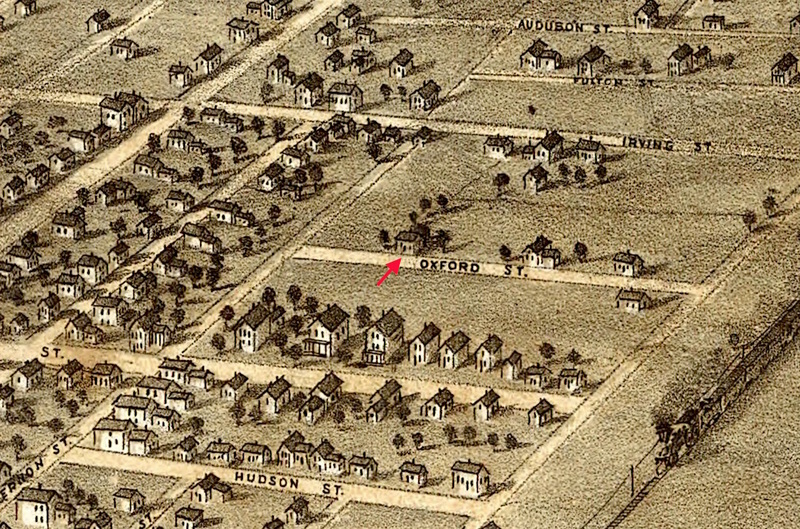 In 1865, Otten and his son Franz moved to what is now 216 Oxford Avenue. He purchased the property outright on October 2, 1865. An 1867 panoramic drawing of Oshkosh by Madison artist Albert Ruger shows the Otten home (I added the red arrow). In November 1865, Otten married Helen Wilhelmine Carls. She was 20-years old and 10-years younger than Rudolph. Helen was born in Württemberg, Germany, but had come to America by the time she was 9. Her life with Rudolph Otten was short and full of death. Otten's 7-year-old son, Franz, died in early 1867. The cause of his death is not known. About two months later, Helen became pregnant. She gave birth to a son they named William. Rudolph was apparently disconnected from the beer business by this time. 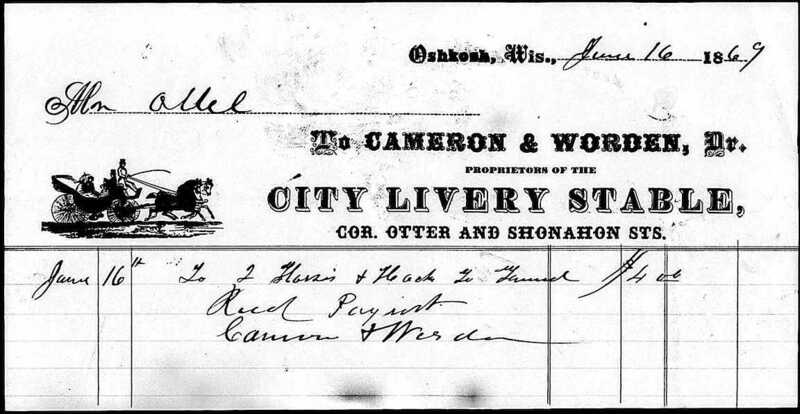 The 1868 Oshkosh City Directory shows him, still living on Oxford, working as a drayman. A year later he was dead. On May 14, 1869, Rudolph Otten passed away at his home on Oxford Avenue. He was 34 years old. He left a one-year-old boy and a 24-year-old wife. The cause of Ottens death is unknown. His brief obituary reveals little about him. It notes that Otten was "mourned by his family and respected by a large circle of friends." And that his "funeral was a large and imposing one." Otten's former popularity makes his current obscurity all the more frustrating. Rudolph's widow, Helen Otten, died not long after. The cause and exact date of her death are unknown. Their son William Otten was raised by Helen's younger brother Christian Carls. They lived in the home on Oxford Avenue that William inherited after his mother died. 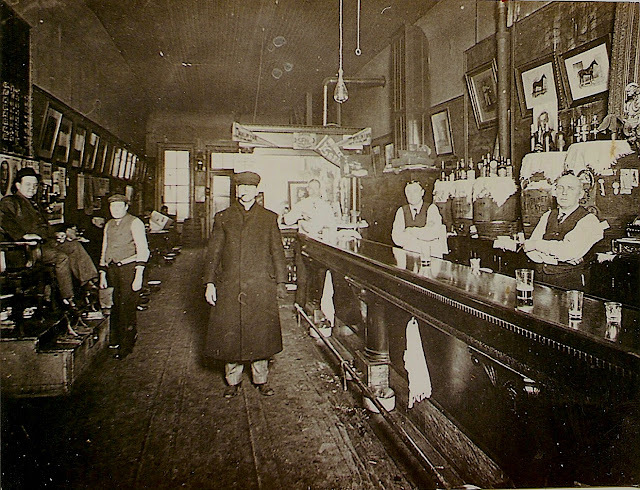 After he came of age, William Otten sold the Oxford Avenue home and went to work as a bartender at Tom Ryan's saloon (no longer standing, it was on the east side of what is now the 300 block of North Main Street). The picture below was taken inside Ryan's saloon at the turn of the century, the period when William Otten worked there. William Otten died in 1900 at the Alexian Brothers' hospital in Oshkosh at the age of 33. His death was attributed to complications associated with dropsy. That was the end of Rudolph Otten's line in Oshkosh. What remains are scraps, just a few things that didn't get lost along with everything else. Like the bill for the hearse that carted Rudolph Otten to the cemetery. And the note from Rudolph Suder who wanted $4.50 for digging the hole Rudolph Otten was buried in. And the receipt for $40 bill from J.J. Moore of Oshkosh Marble for the tombstone laid over Otten’s grave. Rudolph Otten was buried in Block 38 of Riverside Cemetery. The gravestone he shares with his son Franz is still there, but crumbling and close to being swallowed by earth. It's like everything else having to do with him. The last of the nearly forgotten. Oshkosh Beer Seen #001: Can of the Year! 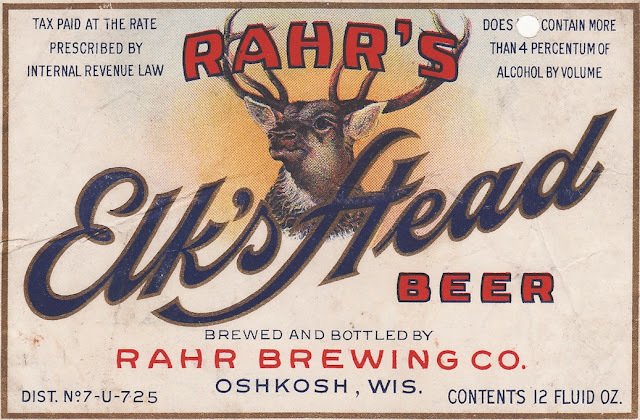 In 1992, Chief Oshkosh Red Lager won the Brewery Collectibles Club of America’s can of the Year award. 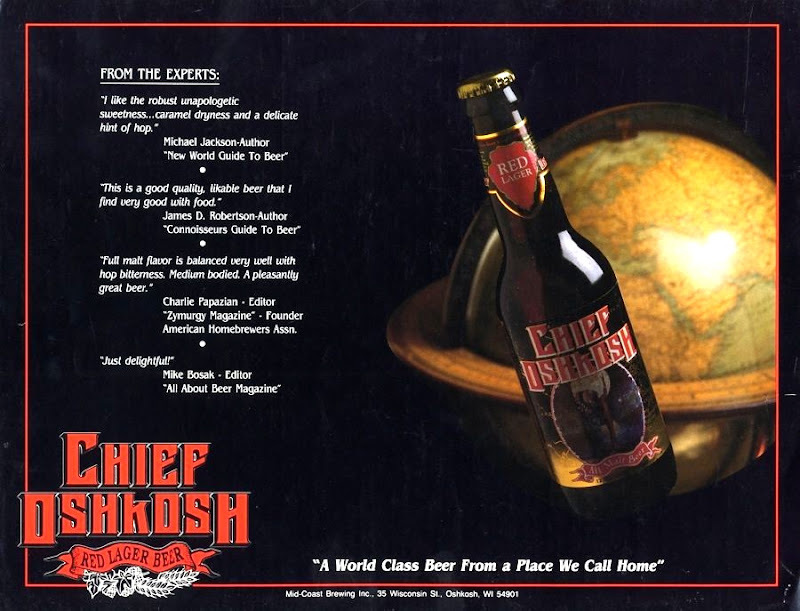 Chief Oshkosh Red Lager was produced by the Mid-Coast Brewing Company of Oshkosh from 1991-1994. It was the first American craft beer packaged in cans. 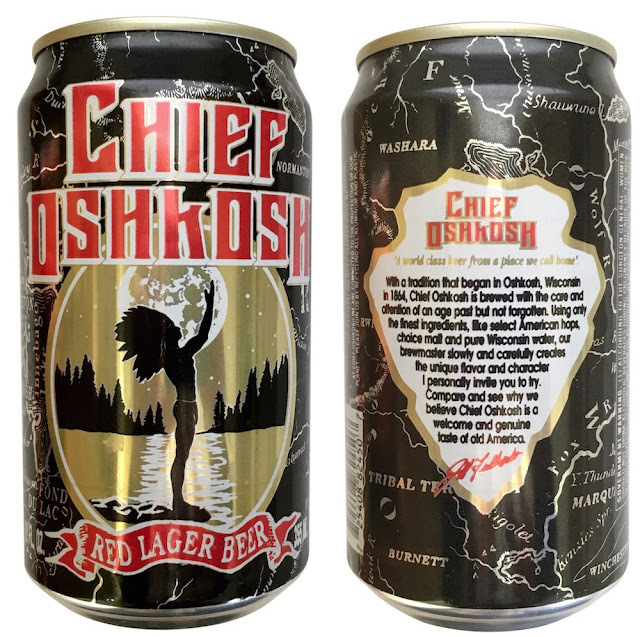 There's much more on Chief Oshkosh Red Lager here. 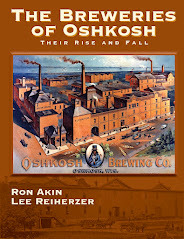 Oshkosh Beer Seen will be an ongoing series featuring images related to beer and brewing in Oshkosh, Wisconsin. Last week, Bare Bones Brewery released its third annual harvest ale. Farm Fresh Pale Ale was brewed with freshly picked cascade hops from Glacial Ridge Hops and Grain Farm in Deerfield, Wisconsin. Farm Fresh Pale Ale is a fresh hop beer, or a wet hop beer if you prefer. These are beers brewed with raw, unprocessed hops. Most hops are dried and pelletized for brewing use. The hops in Farm Fresh went directly into the brew kettle just a few hours after they had been picked in Deerfield. Glacial Ridge Hops and Grain Farm. 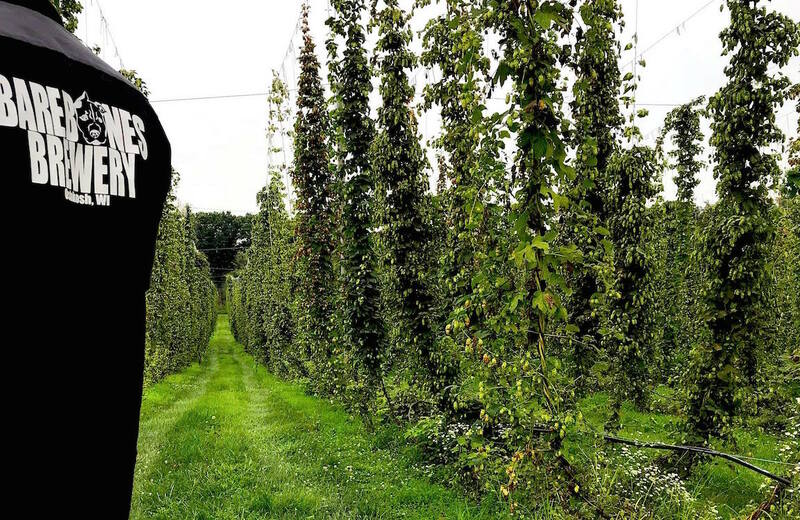 The thought of fresh hops tends to create certain expectations in the mind of the drinker. But often what’s anticipated is not what’s in the glass. The aromatics and flavors of fresh hops tend to be milder than that of processed hops. The flavors are softer and earthier. Farm Fresh Pale Ale captures that. It's a golden beer that carries a formidable 6.7% ABV. The hops come up in the aroma with a spicy, herbal character that made me think of basil. I've noticed this before from Wisconsin-grown Cascades. They're much less citrusy than those grown in Oregon. They more closely resemble the spicy, floral aspect of something like Strisselspalt hops. The beer is full bodied with a classic American pale ale malt structure. Notes of honey and toast play off the spicy flavor of the hops. The bitterness is firm and somewhat lingering. This will be a good beer for the cooler days ahead. It's also an instructive beer. Terroir (the flavor imparted by climate and soil) isn't much discussed in beer. But here you've got a good example of it. 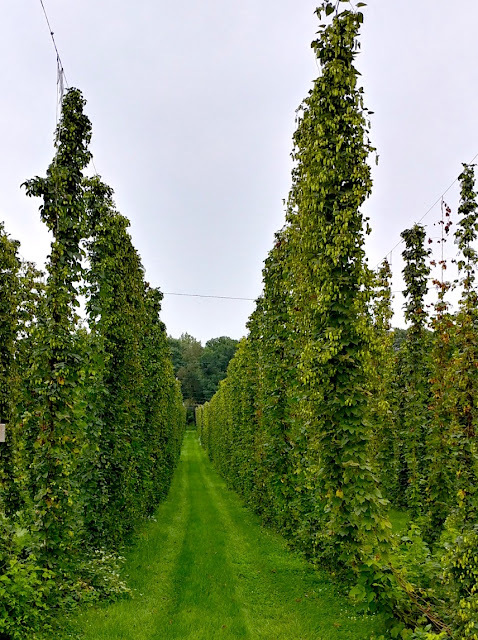 Jody Cleveland, head brewer at Bare Bones, was in Deerfield on August 20 for the hop harvest at Glacial Ridge Hops and Grain farm. Cleveland left for Bare Bones loaded up with 45 pounds of freshly picked cascades. Back in Oshkosh, he started brewing. These beers are an undertaking. The average American craft beer uses about 1.5 pounds of hops per barrel. But because fresh hops carry water weight, brewers typically quadruple their hop load when using them. For Farm Fresh, Cleveland used over six pounds of hops per barrel. In all, it was a 13-hour brew day ending at 10 p.m.
On Wednesday, September 12, the beer went on tap in the Bare Bones taproom. From farm to glass in 22 days. This is as fresh as beer gets. Fresh hop beers haven’t been around all that long, Sierra Nevada’s 1996 Harvest Ale is generally considered the point of origin for the style in America. The first fresh hop beers made in Oshkosh that I'm aware of were the work of homebrewers. There were a few of them made here using homegrown hops in the early 2000s. Commercial brewers in Oshkosh got around to it for the first time in 2016. That year, both Bare Bones and Fox River released their first fresh hop beers. But there were fresh hop beers available here well before any of that. 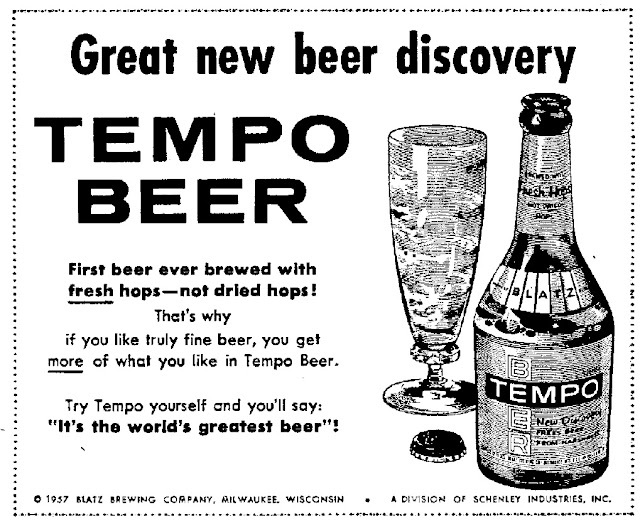 In the summer of 1957, Tempo from Blatz became available in Oshkosh. This was an entirely different kind of fresh hop beer. Oshkosh Daily Northwestern; July 10, 1957. At Blatz, they weren't tossing freshly picked, whole-cone hops into their kettles. They were using fresh hops to make a hop extract. 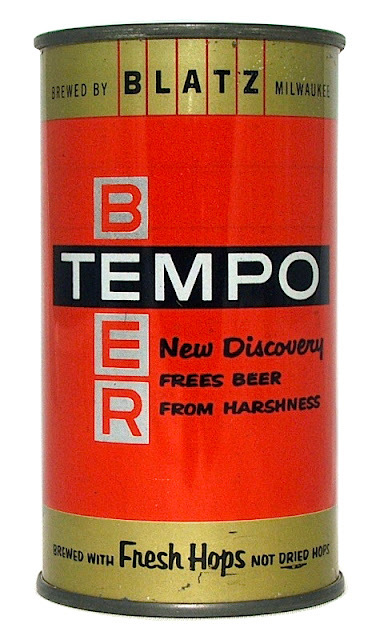 The goal was to reduce hop-derived bitterness. Or as Blatz put it, a brew "Freed from beer harshness." In Oshkosh, you paid a premium for that freedom. 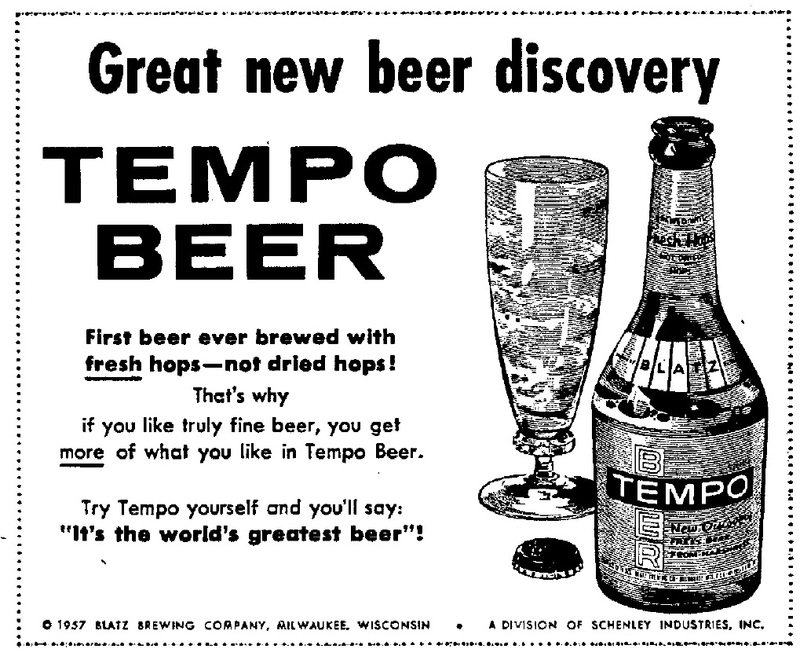 In 1957, s six-pack of Tempo sold for $1.10. A sixer of Chief Oshkosh or Peoples could be had for 89 cents. One last thing about fresh hop beers. It's commonly believed these beers should be consumed at peak freshness. There’s something to that, but I don’t entirely agree with it. Something I’ve noticed when drinking these beers locally the last couple of years is that as they age they develop a depth of flavor that I like quite a bit. I’m looking forward to seeing how Farm Fresh develops in the coming weeks. This past weekend Fifth Ward Brewing in Oshkosh released its first New England-Style IPA. It’s also the first in a series of hazy IPAs Fifth Ward will produce in collaboration with McFleshman's Brewing of Appleton. It’s golden, opaque, and has such an intense hop aroma that you can smell the beer an arms-length away. The scent is all tropical fruit and citrus, somewhere between sweet orange and papaya. The hops are everything here with a palate of candied orange and succulent mango. Bitterness is almost non-existent – there’s just a slight aspirin-like bite at the end that vanishes quickly. This is an impressive beer, with none of the gritty, minerally texture that’s marred so many of the hazy IPAs I’ve had recently. This was a small batch and it may be gone by the time you read this, but hang in there; more is on the way. In late May, McFleshman's Brewing opened in Appleton. Over the past few months, the brewery has had Fifth Ward's self-distributed beer in its line up of guest taps. This beer was born of that relationship. It was brewed in Oshkosh and will be the first in an ongoing series of hazy-IPA collaborations between the two breweries. Ian Wenger of Fifth Ward says they'll brew a larger batch this week, which should see release in late September / early October. This is the third New England-style IPA produced by an Oshkosh brewery. HighHolder Brewing and Fox River Brewing have previously released their takes on the style. The Fifth Ward iteration is arguably the truest to style of those that have been brewed here. Its densely cloudy appearance and exaggerated aromatics are spot on. From the Fifth Ward tap menu. The approach taken was somewhat unorthodox. It’s come to be accepted that to get this style right a brewer needs to apply major adjustments to their water chemistry and ferment with yeast selected for its ability to produce an obdurate haze. But at Fifth Ward, they brewed their hazy with unadorned Oshkosh water and fermented it with a standard, American ale yeast. It worked. "I think it's really more about the process than anything else," Zach Clark of Fifth Ward said. New England IPAs have been kicking around for about eight years. Until this year, though, the style hadn't gained much traction here. That’s not surprising. We’ve been a little slow to jump on any of the hoppy bandwagons. It was at least six years into the West-Coast IPA boom before that developed a substantial following in Oshkosh. 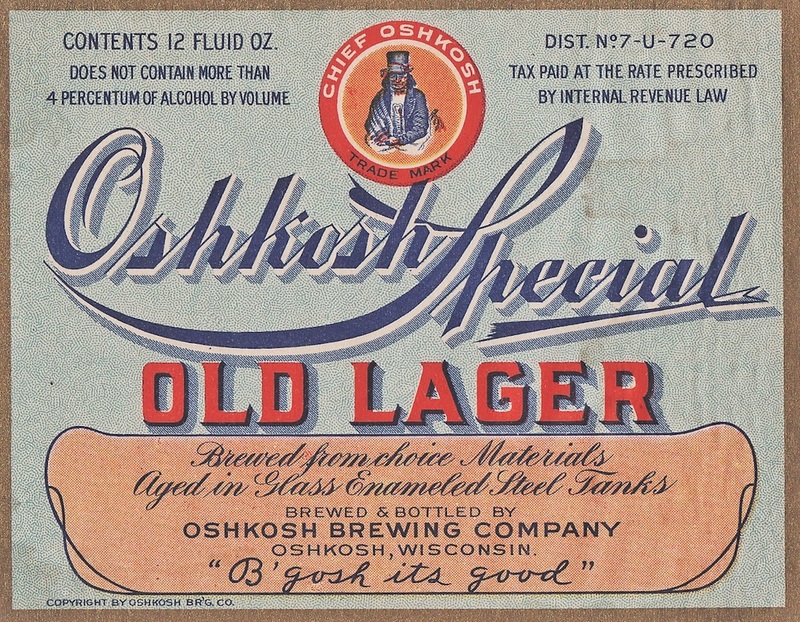 The axiom that Oshkosh drinkers prefer beer that leans towards sweet has been a given here for at least 60 years. That's changing, but to what degree is hard to say. This type of beer, with its low bitterness, may have an easier go of it here. Maybe we're turning another corner. Can a Brut IPA be far behind? In Oshkosh brewery taprooms you'll find no shortage of beers that deliver a hefty punch of alcohol. Beers north of 6% ABV are the norm. There was a brief time, however, when breweries here sold nothing higher than 4% ABV. And people lined up to buy it. Early 1933 Chief Oshkosh Beer label. 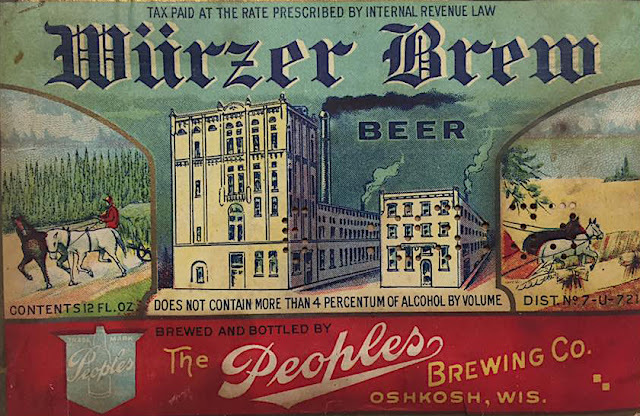 In the eight months prior to the repeal of the 18th Amendment and the end of Prohibition, brewers were permitted to sell beer again for the first time since 1919. But there was a catch. The beer could be no higher than 3.2% alcohol by weight / 4% alcohol by volume. Think about that for a moment. Rarely has there been beer so low in alcohol produced by Oshkosh breweries. Yet this was the most anticipated beer release the city has ever seen. An ad for Rahr Brewing of Oshkosh, March 22, 1933. 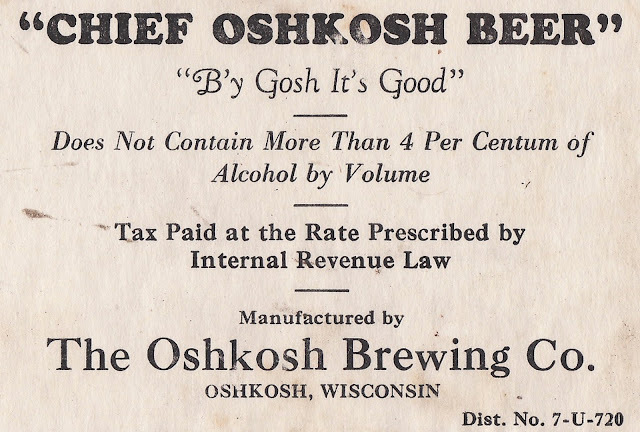 The generic 1933 Chief Oshkosh label at the top of this post is indicative of the haste of local brewers. At the Oshkosh Brewing Company, they couldn't get enough labels printed to cover their initial release of bottled beer. They resorted to using the leftover stock of their pre-Prohibition labels. It was illegal, but the brewery got away with it. Within a few weeks, OBC had its act together and had come up with something flashier. The new Chief Oshkosh label showed the requisite ABV limit and the brewery's Internal Revenue tax permit number. 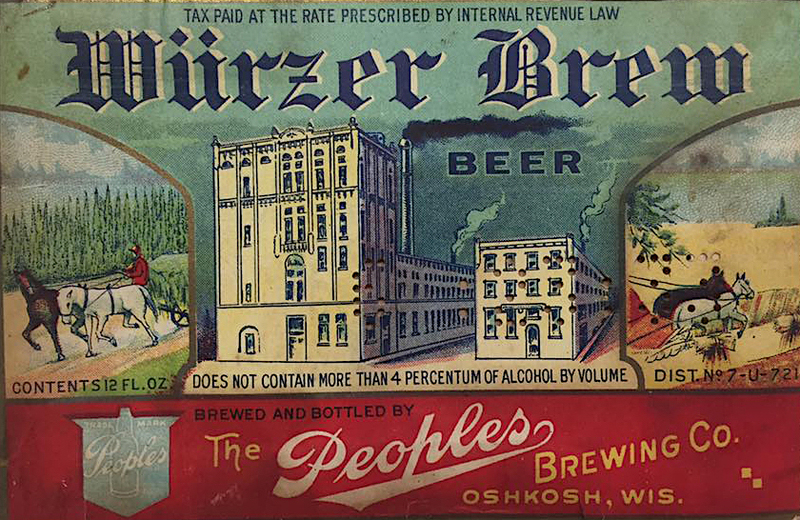 Below is the initial 4% label used by Peoples Brewing Company of Oshkosh. 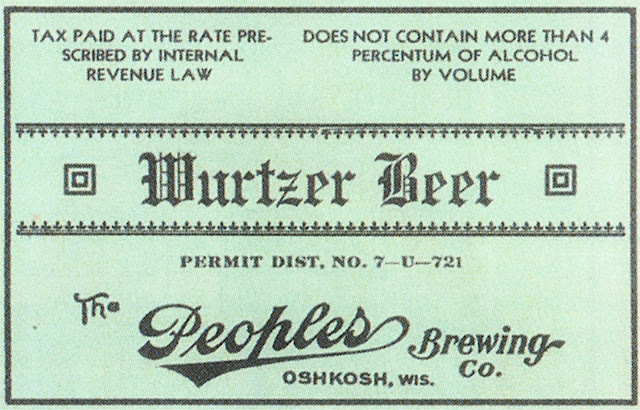 And here’s the more ornate 4% label Peoples was using by the end of spring 1933. Below is the 4% label from Rahr Brewing. Notice the punched out "NOT" from the phrase DOES NOT CONTAIN MORE THAN 4 PERCENTUM OF ALCOHOL BY VOLUME. With the repeal of Prohibition, the 4% limit was lifted. Brewers were permitted to use up their stock of 4% labels. Rahr was one of those that did. At the same time, the brewery wanted customers to know that this wasn't more of that weak beer. The missing "NOT" tells that this label was applied sometime after December 5, 1933, the end of Prohibition and the 4% limit. When Prohibition was repealed, the Oshkosh Brewing Company released a statement saying it saw no need to increase the alcohol content of its beer above 4%. But OBC soon changed its tune. 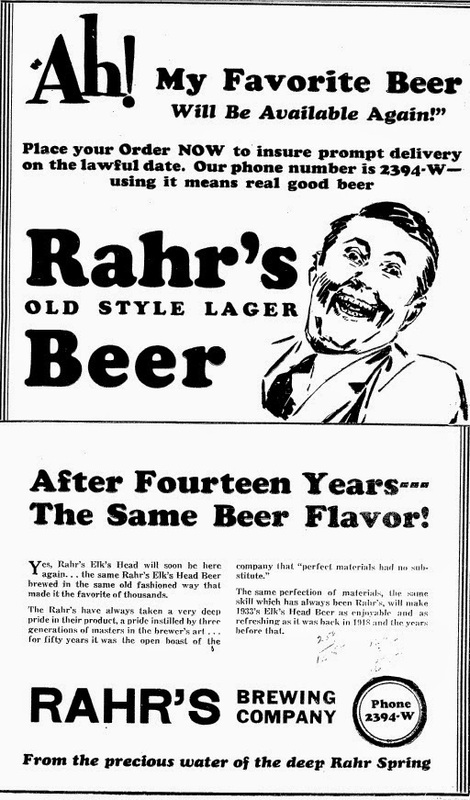 By early 1934, strong beer was pouring into Oshkosh. The strongest among them was 12% Old Derby Ale from Ripon Brewing Company. Rahr Brewing and Peoples Brewing immediately ditched 4% beer. 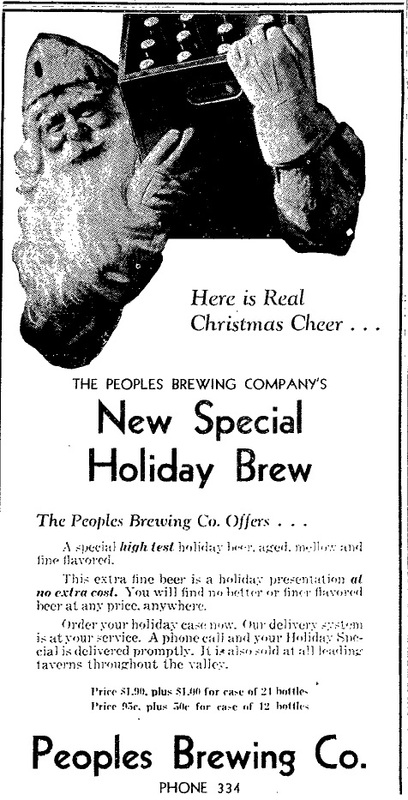 The first "strong" beer Peoples released came in December 1933, when the brewery released its "High-Test" Holiday Brew. That beer was in the neighborhood of 6% ABV. By the end of 1935, Oshkosh's breweries had settled back into a comfortable groove churning out beers that were, on average, just under 5% ABV. There were exceptions. Seasonal releases of holiday beers in November and bock beers in spring tended to creep up to around 6% ABV. But that was about as strong as any of it got. Foxtoberfest has been brewed in Oshkosh for more than 20 years now. It's Fox River Brewing's longest running fall-seasonal and it's pouring once again at the brewery's pub and taproom in Oshkosh. 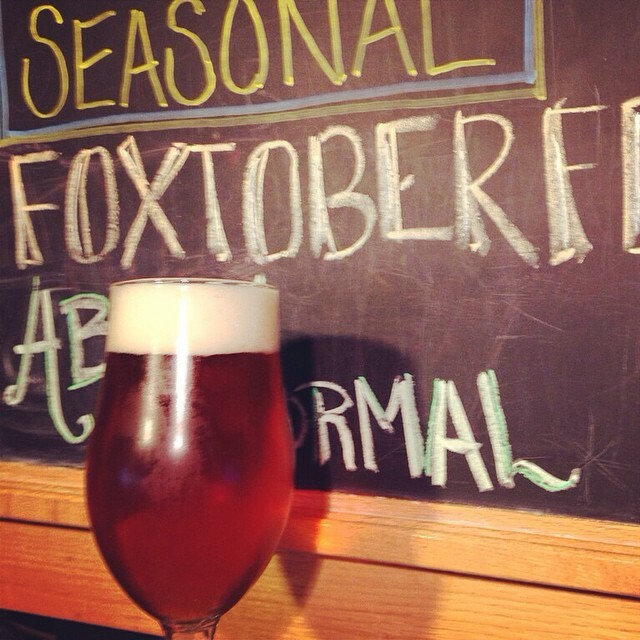 Foxtoberfest is a German-style Märzenbier (better known as an Oktoberfest beer). It looks the part, pouring brilliantly clear with a tight cap of white foam over an amber-hued beer that edges toward red. The aroma tells you everything. The smell of toffee and toasted bread cross over from nose to palate. It's medium bodied and yet rich, a touch lighter than the chewier examples of the style most American brewer's lean towards. The hopping here is perfect. The hops stay out of the way until the very end when just a bit of bitterness appears to balance the sweet maltiness. This is one of my favorite styles of beer and I'm an unabashed fan of this interpretation of it. Over the past twenty years, I've drank this beer 100 times or more; sometimes draft, sometimes from a bottle. For reasons I don’t entirely understand, Foxtoberfest seems especially vulnerable when it passes through a tap line that's anything less than pristine. So, this is one of the rare cases where I tend to prefer the bottled version of a beer. That said, the beer is even better if you can get it from a well-maintained draft line. Germans swarmed to Oshkosh in the mid-1800s and left an indelible mark on the city's beer culture. German-style lagers poured everywhere here where beer was poured. But until the latter half of the 1900s, there was one, prototypical style of German beer that went noticeably missing from tap lists here. Oktoberfest, beers were nowhere to be found in Oshkosh. Of the 16 breweries that operated in Oshkosh prior to 1990, not one of them produced an Oktoberfest beer. 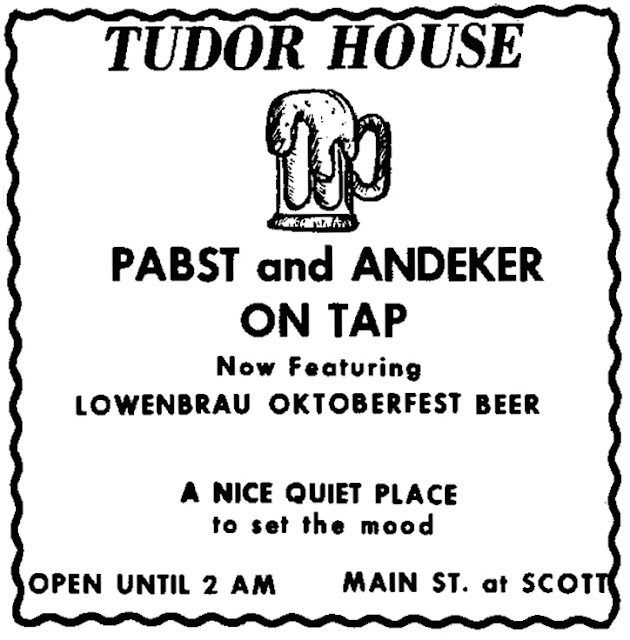 It wasn't until the late 1960s that Oktoberfest beers began catching on here. 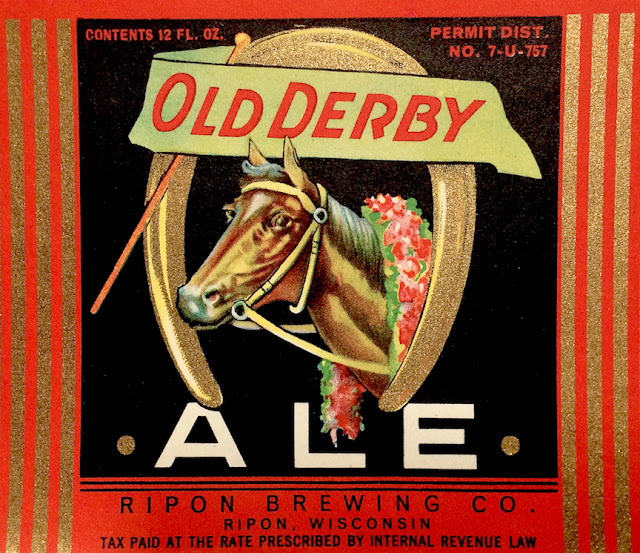 Coincidently (or perhaps not), that occurred at a time when our local breweries were pumping out almost nothing but pale and increasingly bland lagers. The first Oktoberfest beer to reach Oshkosh in any significant way was Lowenbrau Oktoberfest, which was then still being brewed in Munich. From the Oshkosh Advance-Titan, October 8, 1970. Hacker-Pschorr’s Oktoberfest has been pouring at Oblio's every fall ever since. It's become a staple beer at Oblio's. They try to keep it on tap until St. Patrick's Day. I had a pint of it there this weekend. As always, it was wonderful. The Hacker-Pschorr Oktoberfest Tap Handle at Oblio's. Those pints of Oktoberfest poured at Oblio's inspired Oshkosh homebrewers to take up the style. The first Oktoberfest beers made in Oshkosh came out of brew systems cobbled together by homebrewers here in the 1980s. Jeff Fulbright was also among those at Oblio's drinking Hacker-Pschorr’s Oktoberfest. In 1991 Fulbright launched the Mid-Coast Brewing Company of Oshkosh. “My favorite style of beer at the time was Oktoberfest,” Fulbright says. “I wanted to do a toned-down version of an Oktoberfest that people could drink throughout the year.” And with that, Chief Oshkosh Red Lager was born. Finally, in 1997, an Oshkosh brewery produced a full-on Oktoberfest. 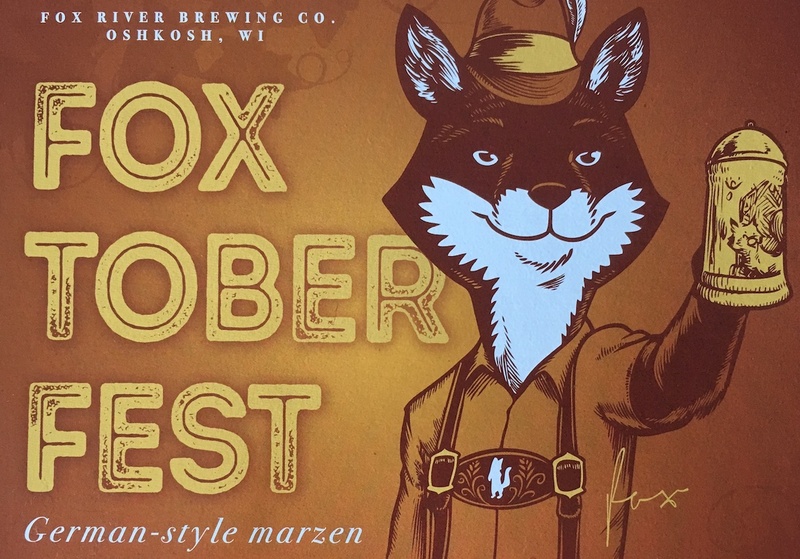 Fox River Brewing's Foxtoberfest became the first Oktoberfest-style beer produced in Oshkosh by a commercial brewery. This year, Bare Bones Brewery produced its first Oktoberfest-style lager. Bare Bones Oktoberfest will be released Wednesday, September 5th in the brewery's taproom. For a style of lager beer that dates back to 1841, it's surprising that it took so long for Oktoberfest beers to be taken up here. We've certainly made up for lost time. These days, Oktoberfest is so ubiquitous in Oshkosh it seems like it couldn't ever have been any other way. But it was.